Prime Real Estate Group prides itself on staying a cut above the rest in your local choices for real estate brokerages. Owner and top-producing agent, Melissa Murphy, began in the industry over a decade ago. “I felt the old-fashioned, antiquated way of business-as-usual as a barrier to growth. I felt resistance for new ideas, limitations for creativity, expansion, and evolution with the market as it changes so very rapidly,” says the Designated Broker. Murphy built an environment focused on the exceptional client experience, industry innovation and a support staff to keep us as agents doing what we are best. Since then, Prime Real Estate has skyrocketed to the top of the local real estate market. Prime is the #4 Independent brokerage in Spokane. With offices in Spokane and Coeur d’Alene, a growing property-management division and a growing clientele of loyal clients, Prime is positioned as a leader in Spokane and North Idaho. Prime prides itself on being students of the market and utilizing the information to be the best stewards of our clients needs. We research market data to ensure skillful negotiations and give our clients the leg-up on their real estate transactions. At Prime, we understand that the client’s needs come first. Every transaction and every sale is different, so there is no “one size fits all” client or broker. The approach of superior service, informed by statistical data, sets us apart from other real estate brokerages in our market. A Spokane native, Melissa Murphy graduated from Gonzaga University with a bachelor’s degree in political science and received her Master in Business Administration in 2012. During her tenure as a top agent, Melissa has listed and sold hundreds of properties throughout Spokane and North Idaho. She has been a predominant player in the world of real estate by evolving as the market has. She has maintained a consistent reputation for high customer service and client success. 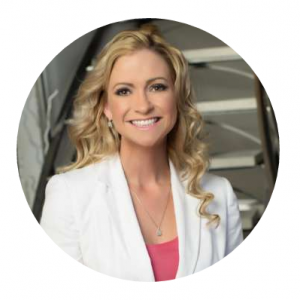 Most recently, Melissa received a nod from Catalyst magazine for Business Woman of the Year. Her brokerage, Prime Real Estate Group, has offices in both Spokane and Coeur d’Alene and comprises 30 agents, in-house agent services and full administrative staff. The name Spokane means “Children of the Sun” and comes from the Native American tribe that live in the area. A fitting name since the area enjoys and average of 260 days of sunshine each year. The city’s nickname is the Lilac City and each year the Lilac Festival celebrates the coming of Spring. It is also home to Bloomsday, the Largest timed foot race in the world with over 50,000 participants per year, and Hoopfest, the largest 3-on-3 basketball tournament in the world. The Spokane region is home to 202,900 residents and around 451,200 in the metropolitan area making it the second largest population base in the state of Washington and is the largest city between Minneapolis and Seattle. The Spokane River runs through the center of the city and the Spokane falls are one of the largest urban waterfalls in the US. There are also 76 lakes, 33 golf courses, five major National Parks all within an easy drive from the city. Coeur d’Alene was named after the local Indians, the name means “Heart of an Awl”. An awl is a tool used to punch holes in leather and wood. It is believed the French fur traders gave them this name because of the tribes shrewdness. Lake Coeur d’Alene is 25 miles long with 135 miles of shoreline and an average depth of 120 feet. It’s home to the golf course with the world’s only floating green, and has been called America’s Most Beautiful Resort Course by Golf Digest magazine. Coeur d’Alene is the largest city in northern Idaho Panhandle with a population of 47.912. Just North of Coeur d’Alene is the theme park Silverwood, the Northwest’s largest theme park. Three ski resorts are close to Coeur d’Alene, Silver Mountain in Kellogg, Lookout Pass in Mullan, and Schweitzer in Sandpoint. Sandpoint lies on the shores of Idaho’s largest lake, 43-mile-long Lake Pend Oreille. The lake is just 30 miles south of the Canadian border. It is surrounded by three major mountain ranges, the Selkirk, Cabinet and Bitterroot ranges. Sandpoint is home to Schweitzer Mountain Resort, Idaho’s largest ski resort. Sandpoint gets only 33 inches of precipitation a year—most of it in the form of fresh powder. In 2011 Sandpoint was named the nation’s “Most Beautiful Small Town” by Rand McNally and USA Today.